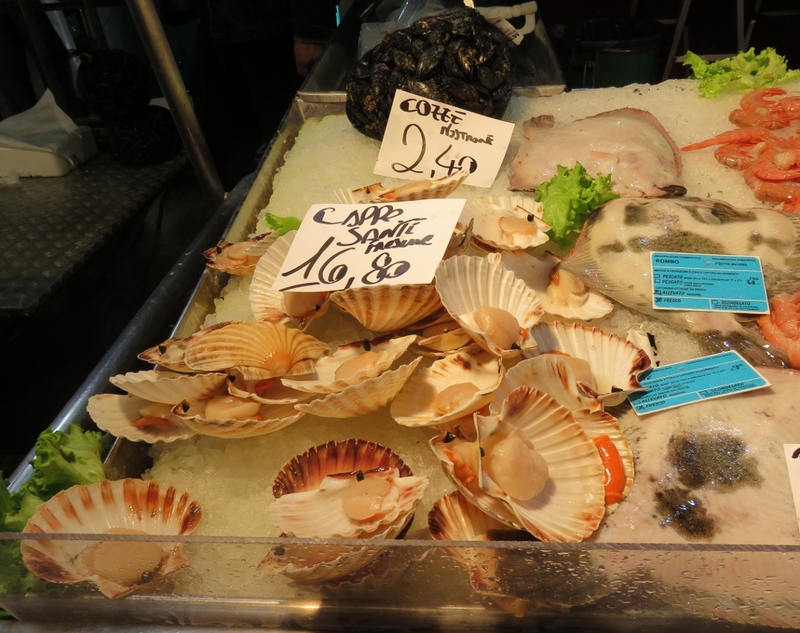 Venice markets and a food tour.. 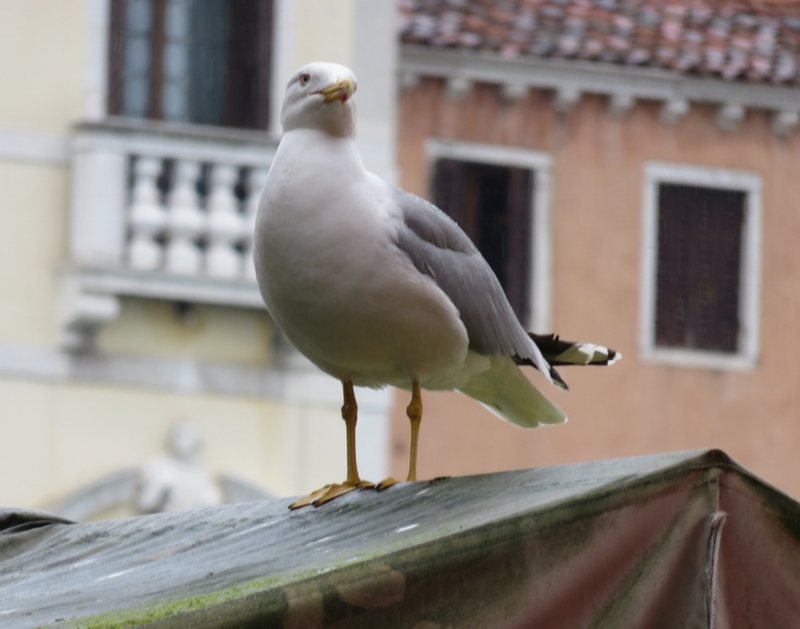 The band is playing, the seagull is watching……it must be market day in Venice! In May we spent a month in Italy, and I’ve finally sorted most of the photos ready for a few posts on Italian gardens, and some markets. 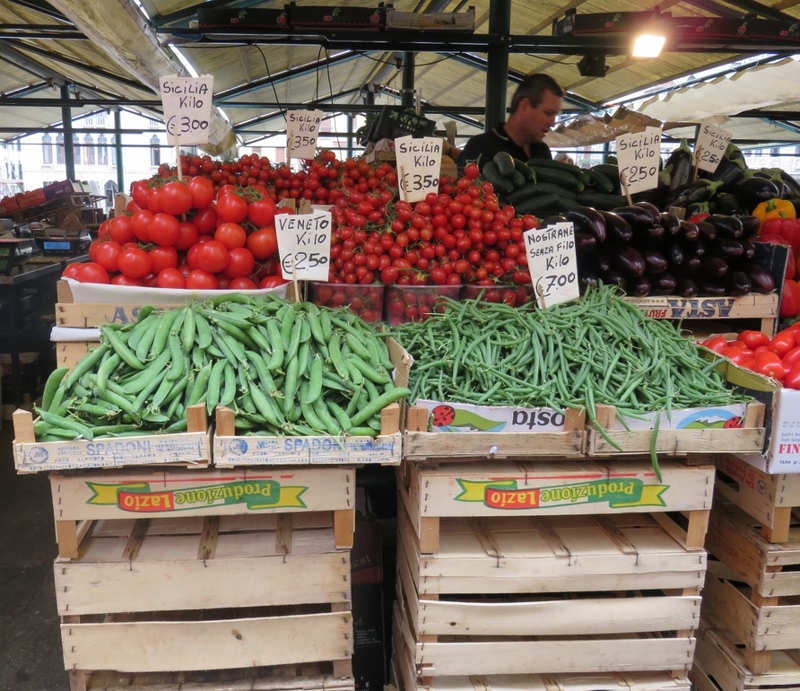 Paul and I are interested in growing food, and we enjoy seeing food at local markets when we are travelling. The markets are behind the stairs. The Rialto markets of Venice (a fish market and a produce market) were built long before the Rialto Bridge was in place. These Markets keep up the tradition of all good markets; that food is much better grown locally, and eaten fresh and in season. 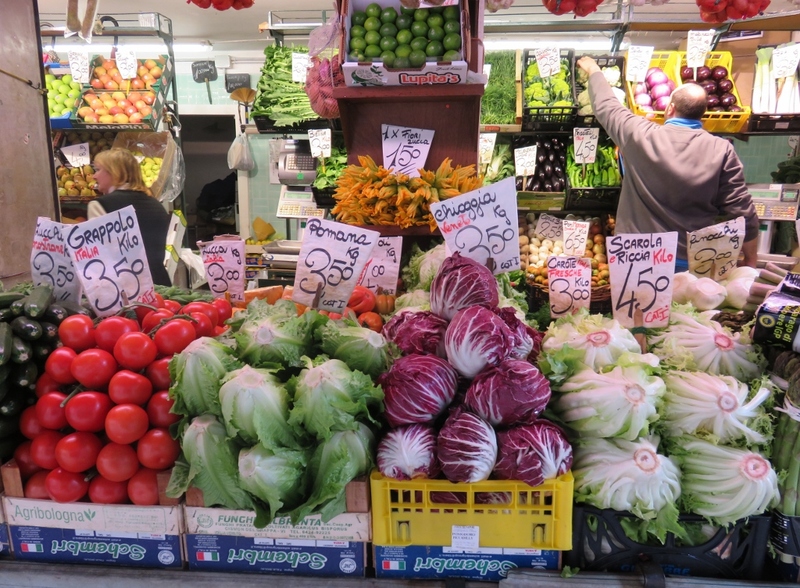 The fruit and vegetables are carefully displayed and clearly marked, a perfect opportunity to learn the names of vegetables in Italian, at the same time as buying the produce! 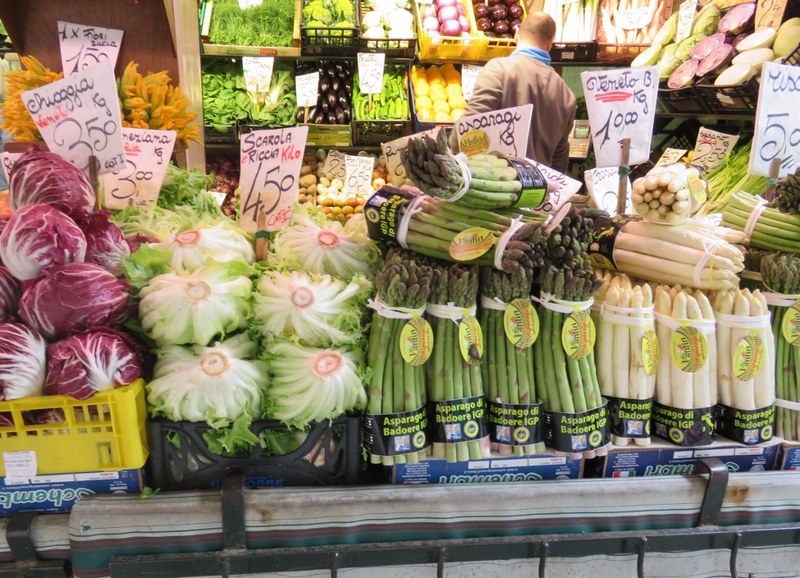 Much of the fresh food is grown on the island of Sant’Erasmo…look at the amazing white Bassano asparagus. 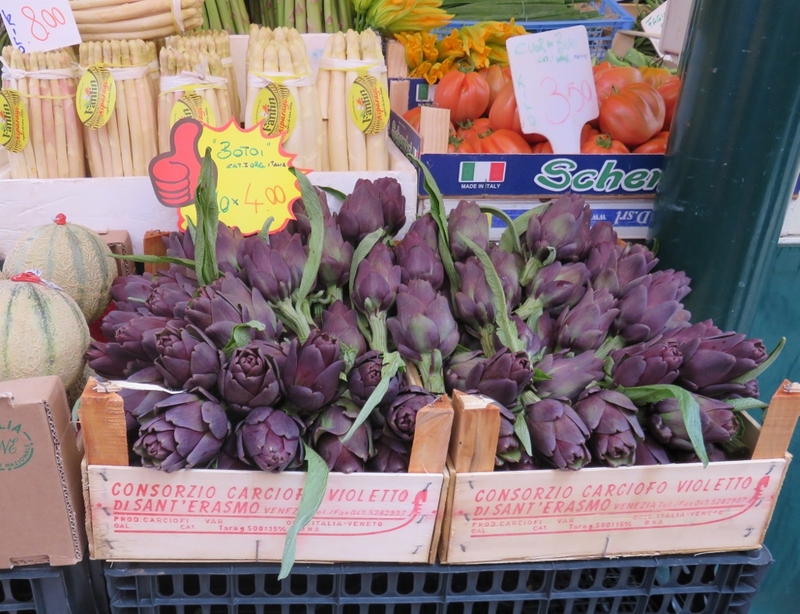 The purple Sant ‘Erasmo artichokes are very popular too. 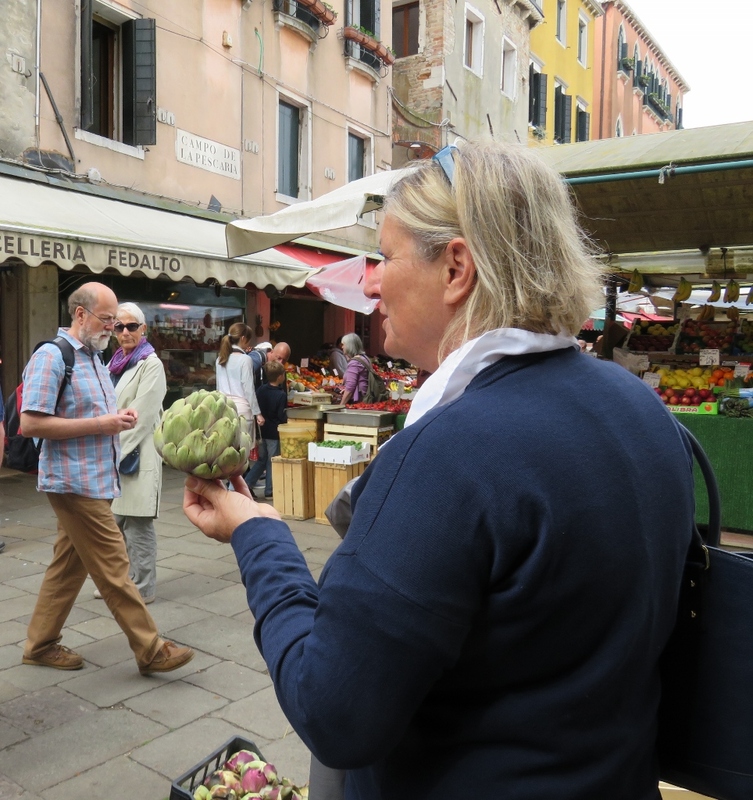 Our guide, Francesca, explains that only the white inner part of this artichoke is used for cooking. 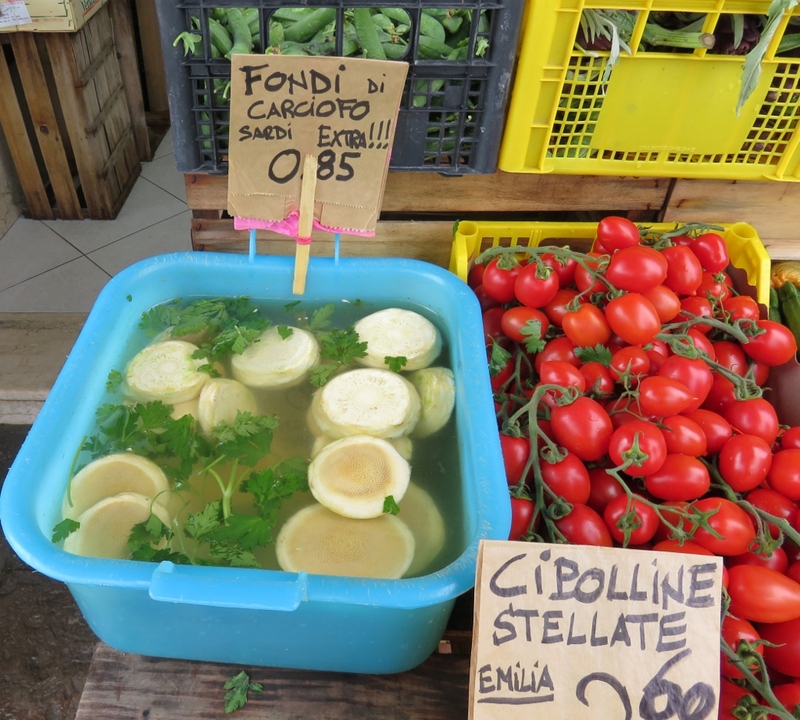 This happy market worker is cutting the artichokes up, and putting the white part into water, for later sales. 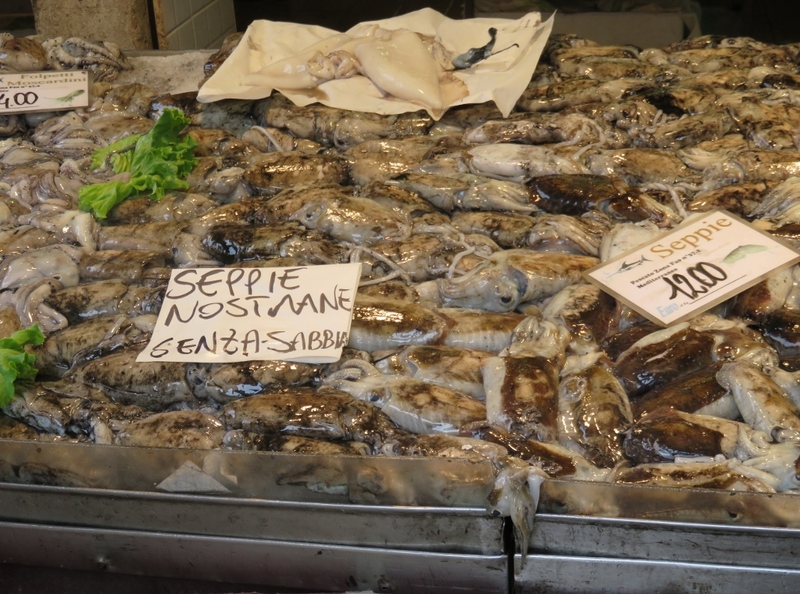 The Piscaria (fish market) was re-built in 1907, and we had heard that sustainable fishing is an old tradition in Venice. The marble plaques show regulations set centuries ago for minimum allowed size for lagoon fish. The fish is glistening with sea water it is so fresh.. 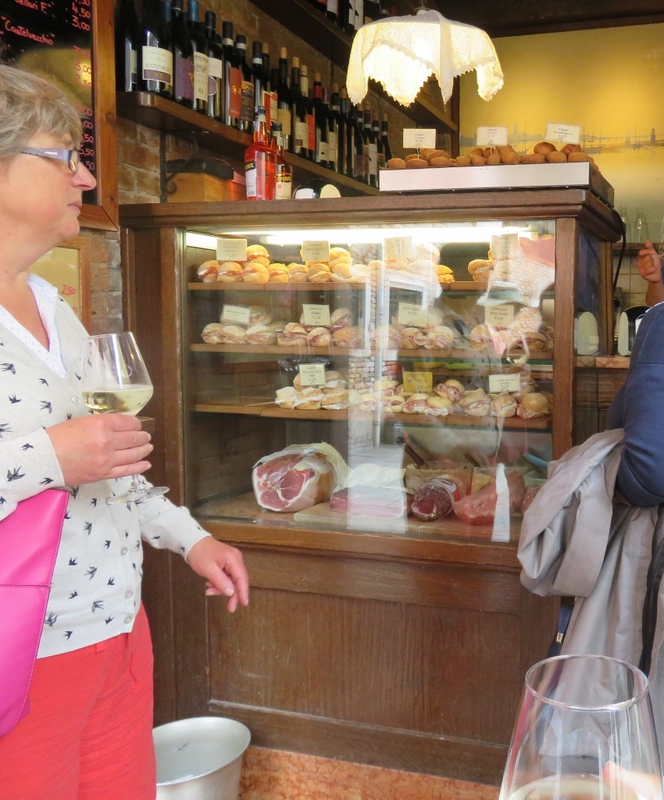 This was our first food tour in Italy, and Francesca guided us towards a tiny bar, full of delicious cicheti (small snacks like mini Panini), and of course, a glass of Prosecco. I had some small artichoke balls, seen on the top of the counter, and they were delicious! 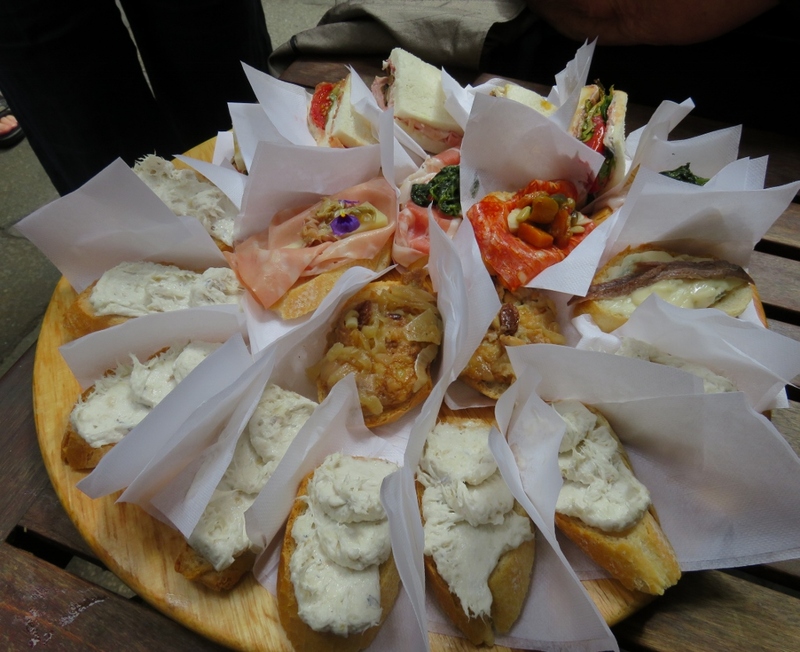 At our next stop we were offered Panini with some traditional serving of Baccala ( a dried salted cod mixture) and a variety of meats, artichoke, olives, anchovy, chilli, mixed vegetables, and beans. 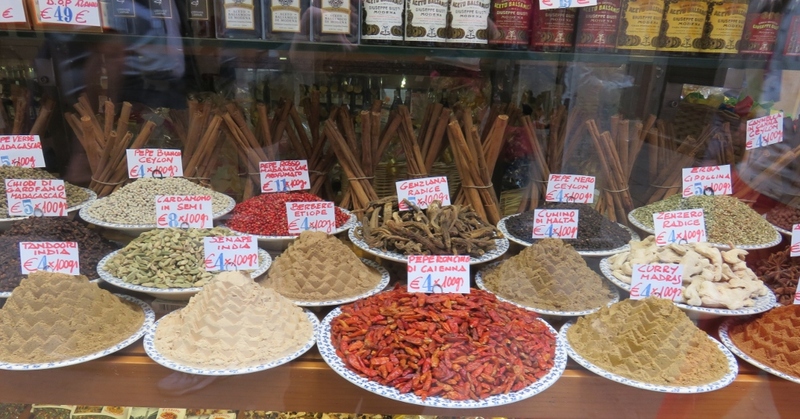 The shop window had an intriguing array of herbs and spices, all artistically arranged on the plates. We went to a restaurant for lunch and had black pasta made with the ink from squid. It is testimony to the lovely food and good company on the tour, that I was too busy eating and talking to take photos of this! The charm of Venice is not just the water and canals, but the small tempting restaurants, often tucked down alleyways, away from the crowds. This entry was posted in Italian Green Spaces and tagged artichokes, Bassano asparagus, cicheti, fish, fruit vegetables, herbs., markets, Panini, Prosecco, Sant' Erasmo, spices, Venice on July 30, 2016 by germac4. Thanks for your delightful post, it’s reminded me of happy times in Venice. Glad you enjoyed it Ruth. 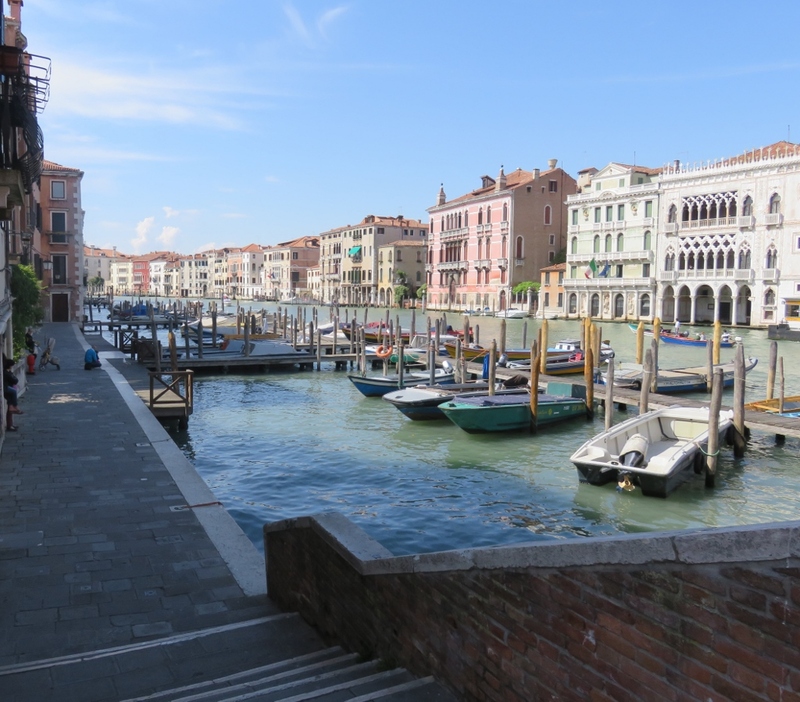 It was our first visit to Venice and we were captivated by it. 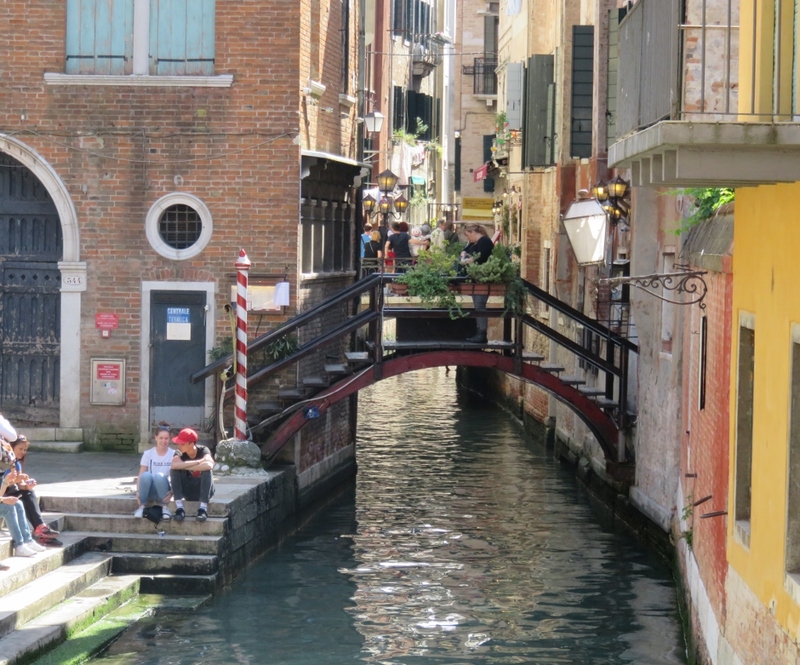 Absolutely agree, everyone should see Venice…and try to get to some of the quieter areas. Those street musicians were great, so enthusiastic! They could well have been the ones serenading you during your visit. Your local markets look wonderful, I would love to visit them. I was very interested to read the history of the markets, there have been similar struggles here to keep things local, and to know exactly where things are grown. You have inspired me to do a few more posts on our markets here…I’m happy to say, our local market is taking a lot of custom away from the big supermarket chains now. Thanks Diane, it is nice to know positive movements like local markets are working in different parts of the world, and if I win the lottery, I’m coming to see yours! Good luck with the Lime Pie! Glad you liked the post, I didn’t think Venice would have much fresh produce, but of course the surrounding areas are very fertile. The white asparagus is incredible! Yes, so true, you can’t beat fresh home grown fruit and veg, we try to buy it every time. I love open air markets, usually so colorful and lively. 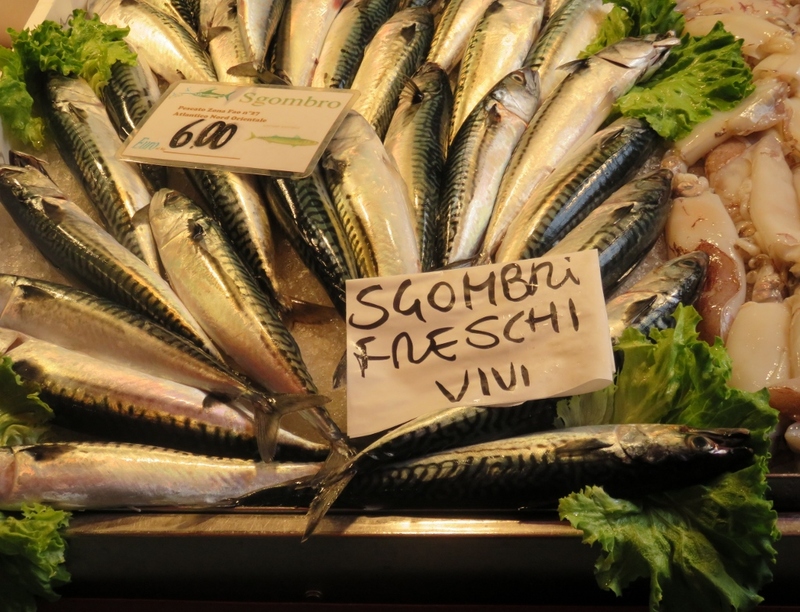 The Venice markets look more so than most, and the food sounds so delicious! Yes we love the markets too, & the people were very happy to give us samples of the food. I hope you are visiting lots of Japanese markets .. 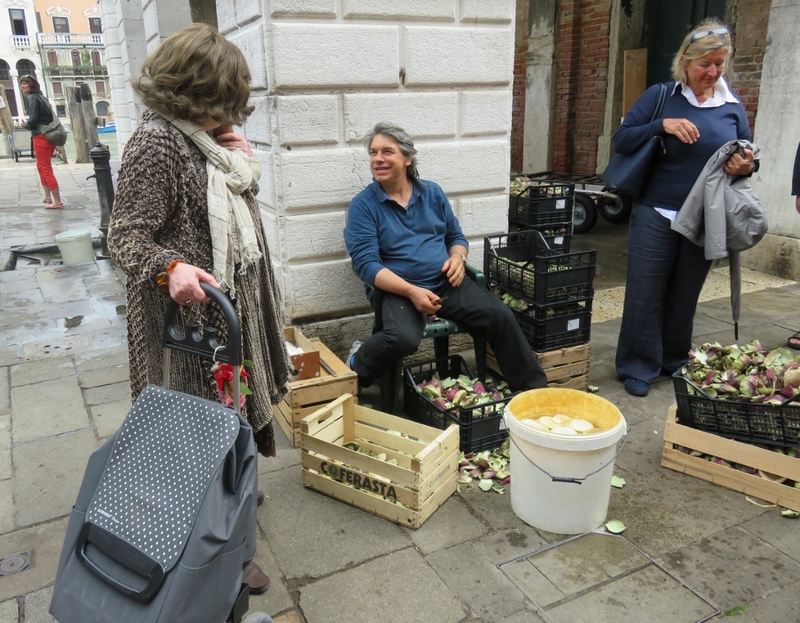 Yes, the markets surprised me in Venice, they were more diverse than I expected them to be..